We pride ourselves in the timely delivery of quality, certified heat-treated pallets through fine-tuned manufacturing and transportation. Don't get caught using the wrong pallet grade. Learn everything you need to know. Paper pallets, including corrugated cardboard pallets offer a number of benefits including ISPM-15 compliance, sanitation, their light weight and ease of recycling. Because they are so easily recycled, they provide an alternative to reusable pallets where reverse logistics is a challenge. They are great for one-way shipping applications and they can be easily customized to a variety of footprint sizes. The ISPM 15 governs the appropriate processes to fumigate wood pallets,boxes and crates. It requires that a pallet’s wood core temperature reaches 132.8° Fahrenheit for at least 30 minutes, or that the wood be fumigated with methyl bromide. We prefer the heat treatment method that adheres to the ISPM standards. The US Environmental Protection Agency (EPA) advocates for phasing out the use of methyl bromide due to negative effects on the Earth’s ozone levels and potential to be toxic. We operate four kilns on two shifts. This means we provide quick turn-around on all heat-treating jobs. 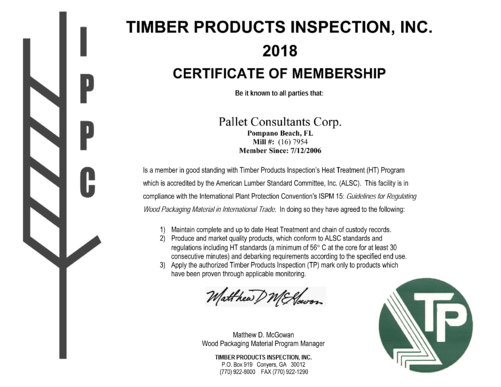 We can heat-treat your existing pallets, custom build and heat-treat new pallets or heat treat recycled pallets to ISPM-15 standards. Our computerized record keeping means you'll always know where you stand. We can provide the documentation so that you can confidently ship your products anywhere in the world. Our experts are always available to discuss your needs and develop a solution.